It’s a sad reality that poachers often target the young of endangered animals, whose only line of defense is the mother or father looking after it. This is true especially for a species as threatened with extinction as the mountain gorilla, which is why this story is just so incredibly heart-wrenching: This buck-toothed gorilla is too dumb-looking to ever scare poachers away from its children. In their rapidly shrinking environment, this gorilla’s young may need to depend on their father for protection from wildlife traffickers looking to sell them on the black market, which is tragic because he just looks way too stupid to threaten anyone. His uneven front teeth are sticking out over his lip and the fur on his head resembles the closest thing to a bowl cut a gorilla could have, meaning that poachers who want to trap his offspring will likely laugh and ignore him altogether while kidnapping his young. For a species that’s already critically threatened, this gorilla’s dorky teeth and the fact that no hunter would view them as a threat to anyone’s safety in a million years is truly sad. 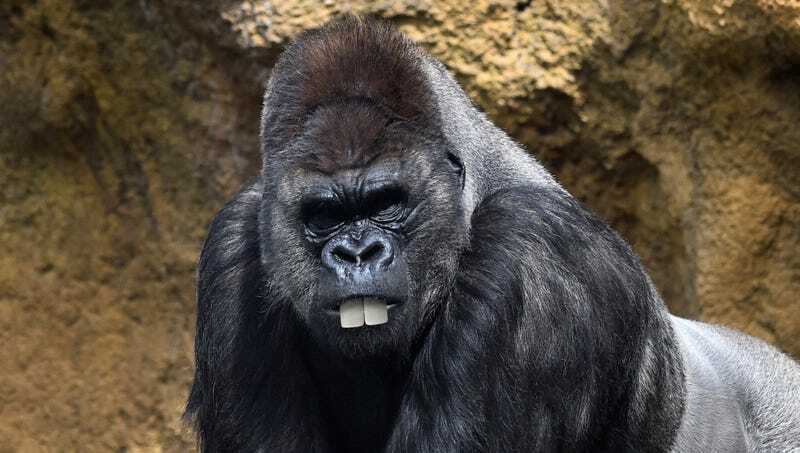 To make matters worse, male gorillas display dominance by bearing their teeth, which makes this specific male’s undeniably goofy overbite even more catastrophic: If poachers try to come for his young, his biological instinct will be to flash the very buckteeth that will convince them to take a picture they will inevitably caption “Check out this dipshit gorilla.” He may also try to beat his chest, which, for this feral Poindexter, just looks astoundingly dumb, like an oversize Chuckie Finster throwing a temper tantrum. Hunters who encounter him will probably laugh at the fact that he seems to have some kind of lisp as far as gorillas go, wonder how a dweeby-looking gorilla like him even found a mate in the first place, and then shoot his children with tranquilizer darts. Wow. The fact that this buck-toothed gorilla looks so comically dumb is a tragedy for wildlife conservation. As a result, his young are basically just sitting ducks. All we can do is hope that other gorillas are better equipped to protect their offspring, because this family of gorillas are goners.